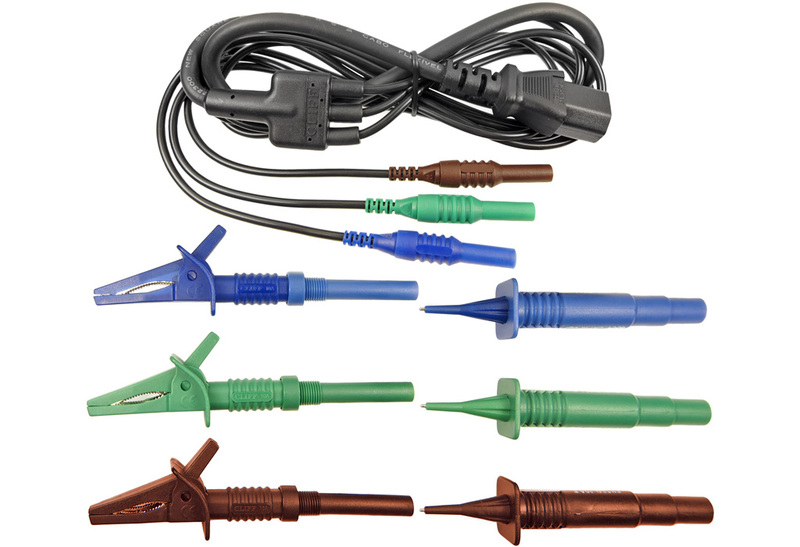 See the PDF data sheet: Mains Plug Test Lead Sets (opens in a new window). 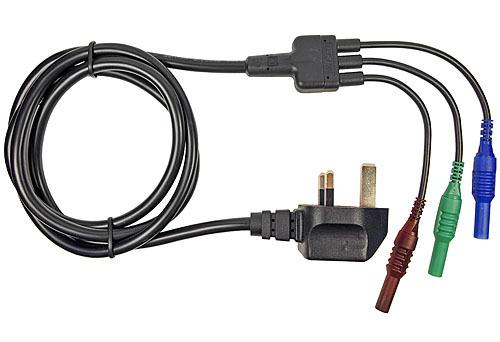 CIH29930 Mains Plug Lead Set: UK plug to 3 x 4mm plugs. Blue / Green / Brown , (all black cables). UK mains plug (BS1363A) with 10A fuse. See the PDF data sheet: Mains Plug Test Lead Sets and CIH29930 lead set drawing (these open in a new window). CIH29940 Mains Plug Lead Set: UK plug to 3 x 4mm plugs with black flying leads. Packed in a plastic wallet. 1.4m cable. FCR29940 Mains Plug Lead Set: UK plug to 3 x 4mm plugs with coloured colored flying leads. Packed in a poly bag. 1.5m cable. Black / Green / Red . See the PDF data sheet: Mains Plug Test Lead Sets and CIH29940 lead set drawing (these open in a new window). 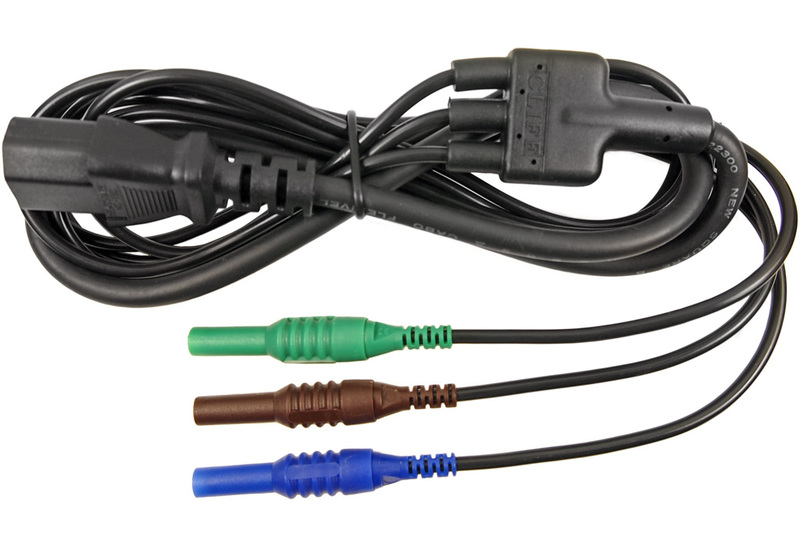 CIH29920 Mains Plug Lead Set: IEC plug to 3 x 4mm plugs. See the PDF data sheet: Mains Plug Test Lead Sets and CIH29920 lead set drawing (these open in a new window). CIH29922 Mains Plug Lead Set: IEC plug to 3 x 4mm plugs including unfused push-fit probes and push-fit crocodile clips. TPR7 unfused push-fit probe: 10A. 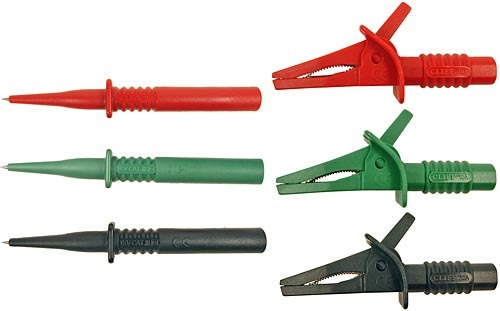 Push-fit crocodile clip: 10A 1000V CAT II, 600V CAT III. 1 x lead - IEC plug to 3 x 4mm straight plugs. 1 x blue TPR7 unfused push-fit probe. 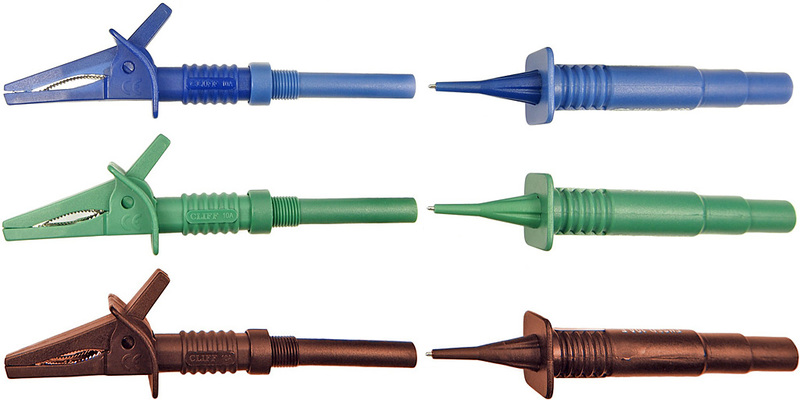 1 x green TPR7 unfused push-fit probe. 1 x brown TPR7 unfused push-fit probe. 1 x blue push-fit crocodile clip. 1 x green push-fit crocodile clip. 1 x brown push-fit crocodile clip. See the PDF data sheet: Mains Plug Test Lead Sets and CIH29922 lead set drawing (these open in a new window). 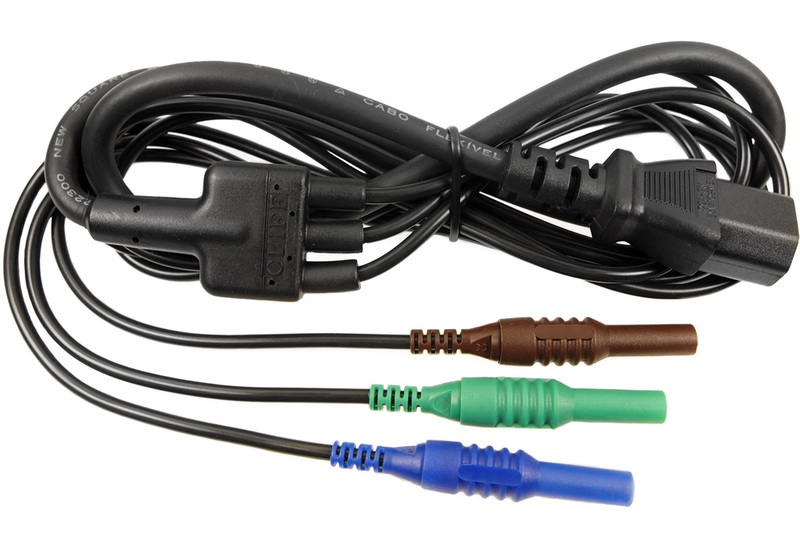 CIH29925 Mains Plug Lead Set: IEC plug to 3 x 4mm plugs including fused probes and screw-fit crocodile clips. Fused: 10A F, 600V HBC 50kA. Screw-fit fused crocodile clip: 10A 1000V CAT II, 600V CAT III. 1 x blue fused probe. 1 x green fused probe. 1 x brown fused probe. 1 x blue screw-fit fused crocodile clip. 1 x green screw-fit fused crocodile clip. 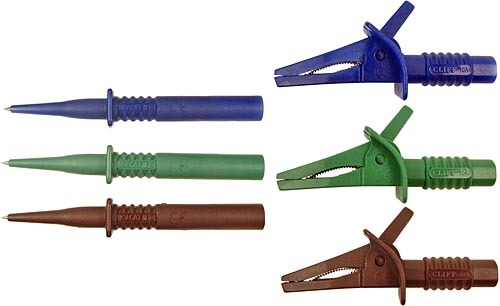 1 x brown screw-fit fused crocodile clip. See the PDF data sheet: Mains Plug Test Lead Sets and CIH29925 lead set drawing (these open in a new window). CIH29921 Mains Plug Lead Set: Hot Condition IEC plug to 3 x 4mm plugs. Rubber cable with 0.925m long fly leads and a total length of 1.575m. 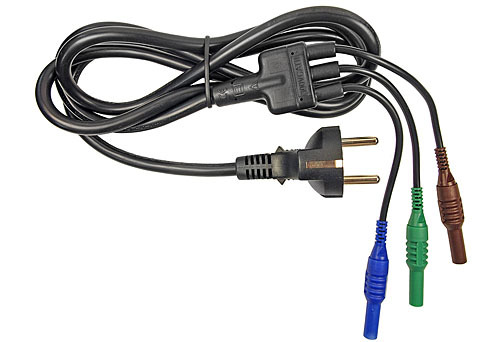 Hot Condition IEC mains plug. See the PDF data sheet: Mains Plug Test Lead Sets and CIH29921 lead set drawing (these open in a new window). 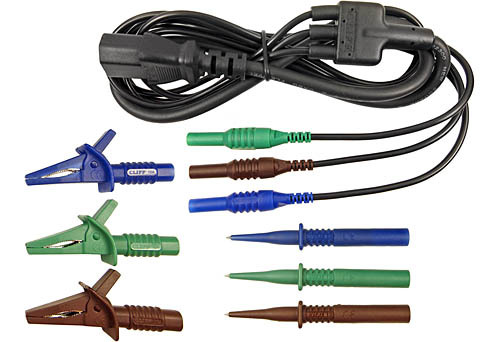 CIH29923 Mains Plug Lead Set: Hot Condition IEC plug to 3 x 4mm plugs including unfused probes and push-fit crocodile clips. 1 x blue TPR7 unfused probe. 1 x green TPR7 unfused probe. 1 x brown TPR7 unfused probe. See the PDF data sheet: Mains Plug Test Lead Sets and CIH29923 lead set drawing (these open in a new window). 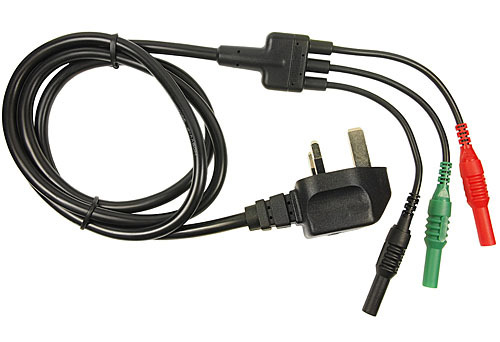 CIH29950 Mains Plug Lead Set: Schuko straight plug to 3 x 4mm plugs. See the PDF data sheet: Mains Plug Test Lead Sets and CIH29950 lead set drawing (these open in a new window). CIH29880 Set of three unfused probes and crocodile clips. 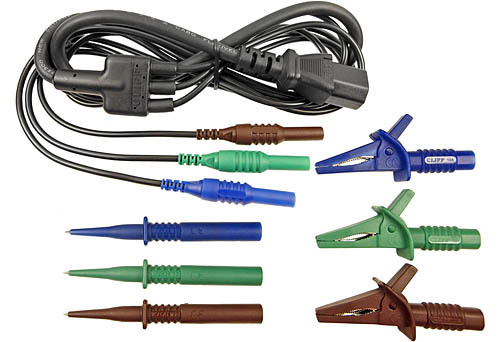 CIH29881 Set of three unfused probes and crocodile clips. CIH29885 Set of three fused probes and crocodile clips. CIH29886 Set of three fused probes and crocodile clips.